Before the completion of the Cape Cod Canal in 1914, the stretch between Great Point and Monomoy was one of the busiest sections of the Atlantic Coast. Nantucket was already an important port in the eighteenth century, with 150 ships involved in whaling by 1775. The residents of Nantucket first clamored for a lighthouse at Great Point, then called Sandy Point, in 1770. In 1784 the General Court of Massachusetts agreed to erect the lighthouse. The first wooden tower was completed by the following year. Former whaleman Capt. Paul Pinkham was the first keeper at a salary of $166.66 per year. In 1791 Pinkham published the era's best chart of Nantucket Island and its surrounding shoals. For the first few years there was no keeper's house at Great Point, so the keepers had to walk or get to the station on horseback, a distance of seven miles. Keeper Pinkham sometimes travelled by boat to Brant Point to get food and supplies. The first keeper's house at Great Point was destroyed by fire in 1812 and subsequently rebuilt. The keeper of Great Point Light had an unusual experience in October 1804, when the schooner Republican came ashore on the outside of Great Point, close to his lighthouse. After the vessel struck, the captain jumped into the water with his wife in his arms. Swimming ashore with her, he reached land as also did the crew. So grateful was the master of the ship to Keeper George Swain for his hospitality and friendliness that he sold the schooner just as it lay on the shore to the keeper for the bargain price of $50. Swain later broke up the schooner for salvage. In 1816, the first Great Point Light was destroyed by fire. Winslow Lewis believed the fire was deliberately set, but nothing was proved. A new 60-foot stone tower was finished in 1818 at a cost of about $7,400. On the northern extremity of the island stands the great light of Nantucket. This light is 70 feet above the level of the sea, in a stone tower 60 feet high. It consists of 14 lamps, three with 15, and eleven with 16-inch reflectors, arranged in the usual way, in two circles parallel to each other and to the horizon. The lantern is 8 1/2 feet high and nine in diameter... This being an exterior and important light, I propose no reduction of it. Premises in sufficient order. In 1842, civil engineer I.W.P. Lewis inspected the tower and found it leaky, the lantern corroded and the reflectors worn out. "No establishment on our coast requires a more efficient light," wrote Lewis. A third-order Fresnel lens was installed in 1857. That same year, the tower was lined with brick and an assistant keeper's house was built. Despite the improved light, shipwrecks continued in the area. Between 1863 and 1890 there were 43 wrecks near the lighthouse. Many of the wrecks occurred because Great Point Light had been confused with the Cross Rip Lightship. 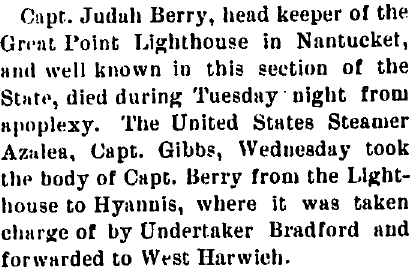 Judah Berry, a 70-year-old former sea captain who served only briefly as keeper, died at the station in January 1904. Berry's travels in his years at sea had taken him to China, Japan, and Africa. On September 23, 1931, the crew of the fishing schooner Elizabeth Foley was saved by the keepers at Great Point when the vessel caught fire two miles from the light. The vessel's crew was rescued from a sinking dory by Keeper Theodore L. Chase and Assistant Keeper Otis E. Walsh. The remains of the schooner have been seen in recent decades near the lighthouse, according to historian Edward Rowe Snow. Keeper William L. Anderson equipped his automobile with special balloon tires to make the trip to town easier. In 1933 Keeper Anderson used this vehicle to bring 350 visitors to the lighthouse. We soon learned to love our station and location. . . It was our well loved home for seven very happy years and our hearts are still in its shifting sands. The hurricane of 1938 gave us quite a beating, but we took it as a part of our life and laughed at our troubles. The storms there are beautiful. The wind swept along the dunes and at the top of the house, but never came low in our little valley. I used to love to walk in the brisk wind along the beach and feel the sting of the sand. As a girl Jeanette sometimes helped her father light the lighthouse's lamp, an act she said made her feel like she was "helping God" guide mariners to shore. At Great Point Light, Nantucket. Front row: Keeper Archford "Ted" Haskins, Betty Haskins, Muriel, and Marla; standing: Barry, Jeanette, Beverly, Merrill, and Vernon. Courtesy of Cheryl Killen Coffin and the Nantucket Shipwreck and Lifesaving Museum. There was a big pond there at Great Point. That's where I learned to go fishing and sailing and all kinds of stuff. I used to do a lot of hunting. I did a lot of things out there. I had a golf course up in the sand dunes. I used tomato cans. I did a lot of beachcombing. I'd swim with sand sharks, eels, all that kind of stuff. And there was a huge nesting area for terns. Thousands and thousands of terns. We had a truck, a Ford truck, and the Coast Guard had a truck. And that's about the only vehicles that were around. We had big balloon tires, called sand tires. You could go to Wauwinet in the track you left a week before, and it was still there except where the tide came in and washed it out. You could just get in the ruts, pull the throttle out, take your hands off the wheel, and she'd track right to Wauwinet. The Flying Santa [Bill Wincapaw or Edward Rowe Snow] dropped presents at Great Point at Christmas. I didn't know what it was at first. I thought somebody was dropping bombs. There might have been three cars out there in the summer. That was it. After I got out of the service I got out there -- I hadn't been there in a long time -- and I counted 75 jeeps in one weekend. I said 'This place has changed! Left: Elsie Grieder, wife of the keeper, in front of the lighthouse tower. Courtesy of Bill Grieder. Above, courtesy of Nantucket Historical Association. Left: Aerial film of Great Point circa 1950s taken by historian Edward Rowe Snow (courtesy of Dorothy Bicknell). Great Point Light was automated in the 1950s. In 1966, the keeper's house was razed by a suspicious fire, leaving the old stone tower standing alone. Erosion gradually brought the seas perilously close to the lighthouse. 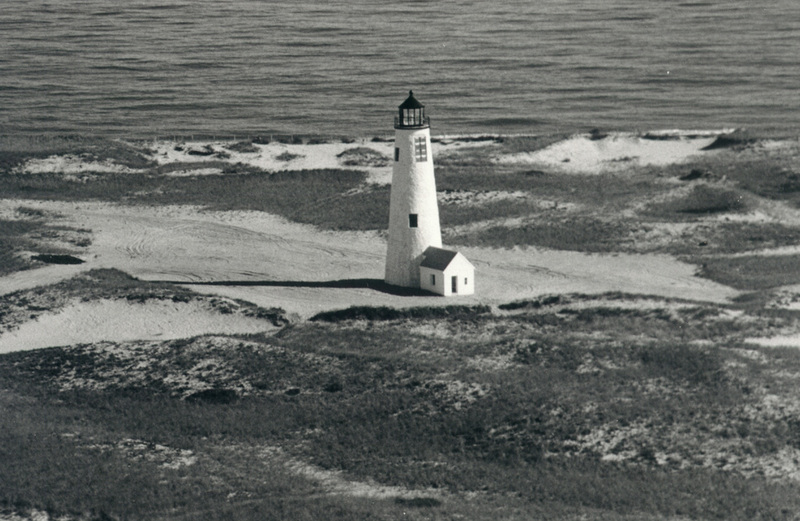 The Coast Guard rejected Nantucket Islanders' pleas to move the lighthouse inland. Some local residents wanted to build an artificial reef to protect the lighthouse. Unfortunately, they never had the chance. In March 1984, a severe storm destroyed the 1818 lighthouse, leaving a pile of rubble. Photographers Rob Benchley and Stan Grossfeld were among the first to reach the wreckage; they and three companions had to wade through a flooded stretch known as the Galls to get to the lighthouse site. A wooden structure temporarily replaced Great Point Light. Here it is being carried by helicopter past Brant Point Light. Courtesy of Daniel F. Kelliher, Jr. The temporary wooden tower in place. Courtesy of Daniel F. Kelliher, Jr. The new Great Point Lighthouse and the temporary wooden tower. Courtesy of Daniel F. Kelliher, Jr. The storm had broken through the barrier beach, temporarily turning the point into an island. 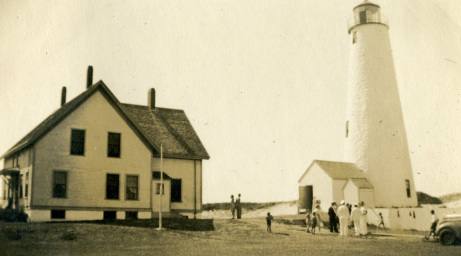 With the help of Senator Edward M. Kennedy, $2 million in federal money was set aside for the building of a new Great Point Light. A replica, 300 yards west of the site of the old tower, was finished by Hydro-Dredge, a New Bedford construction company, in 1986 at a cost of over a million dollars. This was more than 200 times the cost of the tower in 1818. The surplus funds went toward the rehabilitation of Cape Poge Light and Monomoy Point Light. The relighting ceremony was originally scheduled for September 6, 1986, but was cancelled due to thick fog. The ceremony took place the next day instead. 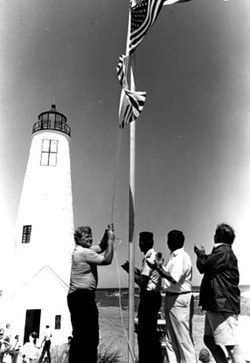 Left: Sen. Kennedy and the Grieders at the dedication of the new lighthouse. Courtesy of Bill Grieder. Senator Kennedy smashed a bottle of champagne against the tower and announced, "Great Point is alive and well again." More than 200 people attended the ceremony, including Jeanette (Haskins) Killen, who lived at Great Point Light from 1937 to 1944. Speaking of her years at the light, Killen said, "It's a difficult way of life, but I think it was the better part of our lives. Sure, we didn't have any of the amenities, but we didn't miss them because we never knew they existed." Nantucket sixth-grade students placed a time capsule inside the new Great Point Light, to be opened in 2011. The time capsule included a cassette of popular music and a can of Classic Coke. A plaque inside the tower reads, "The Egyptians built their pyramids, the Cape and Islanders built their lighthouses. We trust this lasts as long." Great Point is now part of Coatue Wildlife Refuge. Much of the area is off limits because it is a nesting site for the endangered piping plover. There is an access fee to the reservation, and a four-wheel drive vehicle is needed to drive the seven-plus miles over soft sand. From May to October, a natural history tour is offered at Coskata-Coatue Wildlife Refuge. A naturalist guide leads participants on an over-sand vehicle tour through the salt marsh to learn about the geology, ecology, and history of this place and to climb the Great Point Lighthouse. The solar-powered light is visible for 12 miles. The lighthouse is also visible distantly from the ferries to Nantucket. Great Point Light's old third order Fresnel lens is on display outside the Nantucket Lifesaving Museum. Views from the top of the lighthouse tower. Paul Pinkham (1784-1799, died in service); George Swain (1799-1812? ); Jonathan Coffin (1812?-? ); George Bunker (c. 1817); Obed Bunker (c. 1829); Caleb Cushman (c. 1835-1839); Aaron Folger (c. 1840s); Oliver C. Gardner (1846-1854); Obed Bunker II (1854-1861); G. F. Coggeshall (1861-1867); W. S. Allen (1867-1886); Charles F. Swain (1886-1890); Isaac Hamblin (1890-1891); Amasa S. Dyer (1891-1897); Joseph W. Nickerson (1897-1903); Judah Berry (1903-1904); Alfred A. Howard (1904-1906); Frederick E. Tarr (1906-1909); Richard F. Dixon (1909-1911); Milton Gunderson (1911); Thomas J. Kelly (1911-1914); ? Thomas (1914-1919); ? Scharff (1919-1921); ? Carew (1921-1924); ? Dobbins (1924-1926); Theodore L. Chase (1926-1932); William L. Anderson (1932-1935); Frank. A. Grieder (1935-1937); Archford ("Ted") Haskins (1937-1944); Antone S. Sylvia (Coast Guard, 1944-? ); Nicholas E. Norton (Coast Guard, c. 1940s). Assistants: W. S. Allen (1857-1867); John M. Lamb (1867-1872, 1884-1889,1890-1894); Edward G. Coffin (1872-1880); Reuben R. Hobbs (1880-1881); George W. Folger (1881-1884); Benjamin M. Fisher (1884); William D. Appleton (1889-1890); Isaac Hamblin (1894-1895); Alonzo D. Fisher (1895-1897); Michael Campbell (1897); Edward D. Small (1897-1899); George W. Jaques (1899); Harry L. Cook (1899-1901); Marcus E. Howes (1901-1902); Joseph W. Nickerson (1902-1903); Alfred H. Mauton (1904); Roland G. Ryder (1904); Frank Verce (1904); Warren A. Ellis (1907-1908); Richard F. Dixon (1908-1909); Andrew Tullock (1909-1910); James H. Dennis (1910-1912); Henry C. Towle (1912-? ); C. L. Turner (1920); E. D. Smith (1920-1923); ? Dobbins (1923-1924); Fred Leighton (1925-? ); Ralph Norwood (1929); Otis Earl Walsh (1930-1934); Roy Murphy (1935); Octave Ponsart (c. 1933-1936); John Taylor (1936-? ).